62445301681 ../;jsessionid=101791x45x8dt2ywjs1mnrvt9m12zv5.10179?wicket:interface=:0:beta-club:modal-container:modal-content:content:body:login-rixty-form:visibilityContainer:fbconnect::IActivePageBehaviorListener:1:1&wicket:ignoreIfNotActive=true It seems like your browser is preventing Facebook Authentication. This happens when your browser's Tracking Protection is enabled. To continue logging in via Facebook, please turn off Tracking Protection or use a different browser. 62445301681 ../;jsessionid=101791x45x8dt2ywjs1mnrvt9m12zv5.10179?wicket:interface=:0:login-panel-small:login-small:login:modal-container:modal-content:content:body:login-rixty-form:visibilityContainer:fbconnect::IActivePageBehaviorListener:1:1&wicket:ignoreIfNotActive=true It seems like your browser is preventing Facebook Authentication. This happens when your browser's Tracking Protection is enabled. To continue logging in via Facebook, please turn off Tracking Protection or use a different browser. 62445301681 ../;jsessionid=101791x45x8dt2ywjs1mnrvt9m12zv5.10179?wicket:interface=:0:login-panel-small:login-small:signup:modal-container:modal-content:content:signup-form:fbconnect::IActivePageBehaviorListener:1:1&wicket:ignoreIfNotActive=true It seems like your browser is preventing Facebook Authentication. This happens when your browser's Tracking Protection is enabled. To continue logging in via Facebook, please turn off Tracking Protection or use a different browser. 62445301681 ../;jsessionid=101791x45x8dt2ywjs1mnrvt9m12zv5.10179?wicket:interface=:0:redeemcode:modal-container:modal-content:content:body:login-rixty-form:visibilityContainer:fbconnect::IActivePageBehaviorListener:1:1&wicket:ignoreIfNotActive=true It seems like your browser is preventing Facebook Authentication. This happens when your browser's Tracking Protection is enabled. To continue logging in via Facebook, please turn off Tracking Protection or use a different browser. 1. Buy a OneCard card at a store near you. 2. Redeem the OneCard card into your OneCard account. 3. 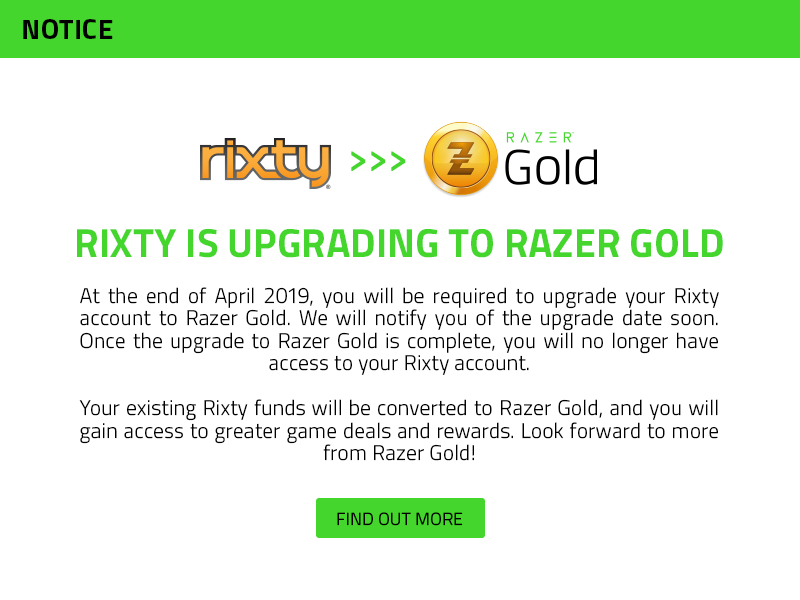 Begin checkout at any game that accepts Rixty. 4. Choose OneCard as the form of payment, and complete payment by entering your OneCard account credentials. RixtyCode Type: N/A. Transfer occurs from OneCard account into Rixty account. You can buy OneCard cards at over 9,000 retail stores in 17 countries, including Algeria, Bahrain, Egypt, Gambia, Indonesia, Jordan, Kuwait, Lebanon, Libya, Oman, Palestine, Qatar, Saudi Arabia, Sudan, Syria, Turkey and United Arab Emirates. CLICK HERE to find the store location nearest you. OneCard cards are valued in the currency used to purchase them. When you load your Rixty account from your OneCard account, you’ll convert from that currency to US dollars. To see the current exchange rate for your currency, please visit www.xe.com. Want to see how easy it is? CLICK HERE for a complete step-by-step guide on how to use OneCard to load your Rixty account.